Hammerfest, the northernmost town in the world. The dock is within walking distance of town or at Fuglenes, about a mile away. Rather than tie up at Fuglenes, ships sometimes anchor and tender passengers ashore to the dock in the town center. 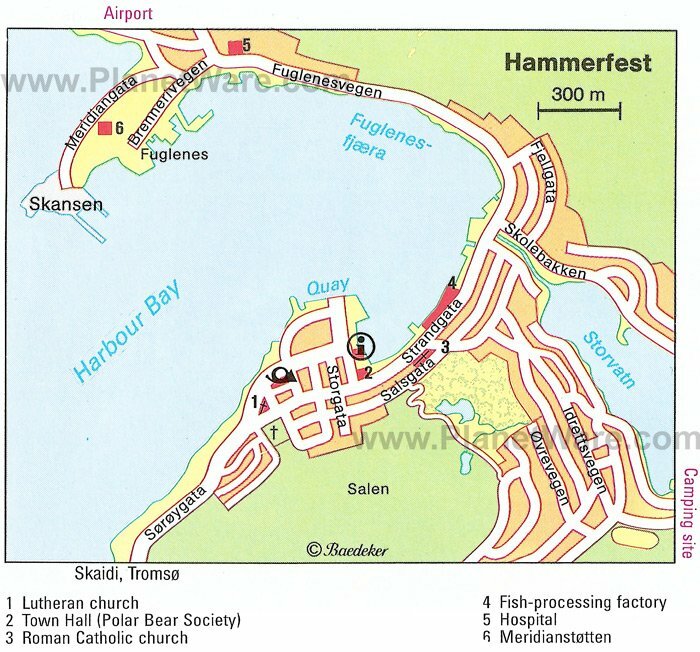 "Hammerfest" means "mooring place" and refers to the natural harbor (remarkably ice free year-round thanks to the Gulf Stream) formed by the crags in the mountain. Hammerfest – the world's northernmost town – is one of the most important travel destinations in North Norway. Over 250,000 tourists visit the town annually. The borough has approx. 9200 inhabitants, and a surface area of about 844 km2. It covers parts of the islands of Sørøya, Kvaløya and Seiland, and since it was awarded city status in 1789, it has been the natural center of the region. Trade and industry is characterised by fishing, fish processing, the Snøhvit field (LNG), service industries and tourism. The Meridian Column - This beautiful memorial was raised in 1856 to commemorate the first project to measure the exact size and shape of the earth. The memorial is in the Fuglenes area of Hammerfest. ATMs in Norway are called Minibank. Nearly all stores accept major credit cards such as Mastercard and Visa (Bring your passport/driver's license, as you are required to identify yourself when using a credit card). Norwegian is the official language of Norway. The language is very close and mutually intelligible with the two other Scandinavian languages, English widely spoken. Most Norwegian households are connected to the internet in some way (often broadband), making Cybercafés hard to find outside major cities, due to a relatively small market. Most public libraries have free public access to the internet. WiFi is in many spots (not free). Opening hours in Norway are better than they used to be, but many smaller stores still close early on Saturday (1 PM or 3 PM is typical) and nearly everything is closed on Sundays. You'll often see opening hours written as "9-21 (9-18)" on doors, meaning 9 AM to 9 PM weekdays, 9 AM to 6 PM Saturday. For public holidays click here.